Of the many natural scenic resorts surrounding Beijing, the Wuling Mountain Resort is among the most sought after by residents hoping to escape the daily grind of city life. Located in Miyun County some 150 kilometers east of Beijing, Wuling Mountain is a national-level forest reserve included in packages of affordable China tours. What distinguishes the reserve from other similar mountain resorts in suburban Beijing is its many creeks, waterfalls and moisture-rich air. Hikers visiting Wuling Mountain can always find tumbling creeks and occasional waterfalls as they make their way up the mountain. The most magnificent water feature of the resort is the Dragon Pond Waterfall. A broad curtain of water, 56 metres high, pours over the canyon, with the sound created by the rushing water resonating throughout the valley. On the northern slope of the Wuling Mountain, tourists can also find a one hundred kilometer stretch of Ming dynasty Great Wall. The mountain used to be the natural defensive barrier protecting Beijing (a most-visited city included in top 10 China tour packages) from invasion. Today, all that remains of the Great Wall is debris from the watch towers and collapsed walls. Other major sightseeing areas at Wuling Mountain are named after the landmarks within the area. For instance, the Five Dragon Head scenic spot is known for its five giant rocks resembling the head of dragons and in the Tower of Immortals there is a 48 meter tall rock structured like a tower. The peak of Wuling Mountain is 2118 meters above sea level, and the scenery differs depending on your altitude. The best season to visit Wuling Mountain is in the summer and autumn. Tourists can reside in one of the family-run hotels or hostels at the foot of the mountain. Take Bus No. 980 to Miyun county at Dongzhimen Station. Take Bus No.38 and get off at Caojia road. The west gate of the Muling Mountain resort is within walking distance from the bus station. Wuling Mountain Resort is always contained in popular China travel package. "One cannot be called a real man until he has reached the Great Wall." This is a famous line from one of Mao Zedong's poems. But if you visit the Badaling section of the Great Wall, the best-known among tourists, especially during a big Chinese holiday, you may find yourself in an awkward situation: The scenery is good, but it's hard to enjoy it when you are squeezed in a big crowd. To avoid the throngs of tourists, many are choosing to explore other parts of the more than 8,000-kilometer-long Great Wall (a must-see destination included in packages of China travel deals), mostly built during the Ming Dynasty (1368-1644), or its remains in some cases, as many segments have not been repaired in decades or even centuries. 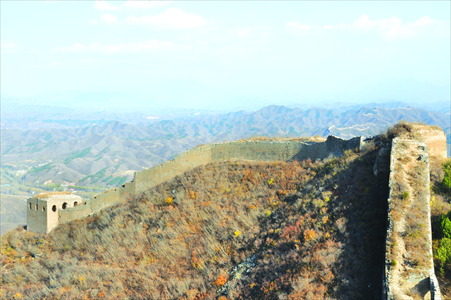 There are a great number of wild sections of the Great Wall outside of urban Beijing and in the nearby Hebei Province. I chose to see a place called Gubeikou, as it is not too far and is ideal for a day trip or weekend excursion. It is also worth visiting for the cluster of attractions that surround this stretch of wild wall. Located in northeastern Miyun county, Gubeikou is about 120 kilometers from downtown Beijing (listed in the top 10 China tour packages). As small as it is, a total of about 25 kilometers of the Great Wall snakes through the town. It consists of four main parts: Wohushan Great Wall, Panlongshan Great Wall, Simatai Great Wall and Jinshanling Great Wall, which is mostly in Hebei Province. Built during the later years of the Northern and Southern Dynasties (386-589), and reinforced during the reign of Emperor Hongwu (1368-98) of the Ming Dynasty, this part of the Great Wall has a history of over 1,000 years. Like the other parts of the Great Wall, its original purpose was to ward off invaders from the northern areas. And as a strategic pass to Inner Mongolia and Northeast China, over the centuries, it has witnessed countless wars, 138 of which were recorded in historical documents. This area of the wall began to fall into disrepair during the early Qing Dynasty (1644-1911), as Emperor Kangxi (1654-1722) believed even the strongest wall could not prevent war if the ruler did not have the support of civilians. However, battles on the Gubeikou Great Wall were a common occurrence after his rule, the most recent skirmish being in 1933, when three Chinese divisions fought against an invasion from the Japanese army. The clash lasted for over two months, from March to May, with casualties of more than 4,000 on the Chinese side and 2,000 on the Japanese side. This incident is remembered as a bloody chapter in Chinese history, with a mass grave of over 360 Chinese soldiers buried at the foot of this section of the Great Wall. Each of the four parts of the Gubeikou Great Wall is known for something different. Jinshanling is famous for the large number of different buildings that were constructed along the wall, varying in structure and form. Simatai is known for its danger, as much of this section was built on high bluffs, and some areas are so steep they're nearly upright. The Panlongshan section, named for Panlong Hill, which lies at a relatively low 150 meters at its highest point, has the most storied past. It is said that Qi Jiguang, an important Ming Dynasty general, used one of the buildings as an office, and the top of another building was blown off by a Japanese plane in 1933. The Wohushan section is on Wohu Hill, from whose summit hikers can view the nearby village and some of the best scenery the Great Wall has to offer. The Great Wall has made great contribution to China tourism. For those who are not interested in the history or structure of the Great Wall, or those with limited time, one or two sections of the four might be preferable. As a visitor who did not have much knowledge about local geography, I was led by GPS to the foot of Wohu Hill before I realized it. Yet, it was not easy to find the right way up, though the Great Wall seemed just within reach. As it is an informal tourist site, there are no signs or arrows to help visitors find their way. If it were not for the guidance of a local woman, I might have spent the rest of the day wandering at the foot of the hill, because the path openings were so heavily covered in branches. The lower end of the path was made of dirt and stone, flat and wide, lined with thickets of wild trees I could not name. In the late autumn season, the folds of yellow, red and brown leaves reminded me of Fragrant Hills Park (Beijing's biggest destination for viewing autumn leaves). But in fact, being on the wall was more rewarding, as Fragrant Hills is notoriously overcrowded and its leaves are often picked away. About 15 minutes into my trek, the path gradually became narrow and steep. Very often, there was only room enough for one person to pass at a time, with nothing to hold on to for safety. Climbers also need to look out for loose stones underfoot, as they can easily cause you to lose your footing, as well as sharp spines of the nearby plants, which may hurt you or snag your clothes. Yet, despite all these cautionary warnings, for those who seek a raw adventure, this journey is right up your alley. The walk up to the wall takes over 30 minutes, and it's a hard climb for some. Once the top is reached, the pace can be slowed and the scenery simply enjoyed. I had a conflicted feeling when I finally stood on the remains of the Great Wall. On one hand I admired such a great feat of construction, completely made by hand hundreds of years ago, but on the other hand, I felt regret for how it looked now. Parts of the wall have collapsed, with few complete bricks still in place. Grasses grow in abundance through the cracks between bricks, which also bear the scars of past battles, acting as a constant reminder of the bloody history of this monument. Between crumbling segments, there are also parts of the wall that are in relatively good condition, but from time to time, you will find the names of previous visitors carved into the many-storied bricks. You will also find that some bricks are missing, leaving a dreadful hole in the wall. Beside the Great Wall, in the bushes, there is often litter, like empty bottles, plastic bags, used tissues and empty cigarette packs. One of my traveling companions, surnamed Zhao, who had been to many other parts of the Great Wall, told me that littering is common in many other areas as well. And what's worse, some local residents steal bricks from the Great Wall to sell. 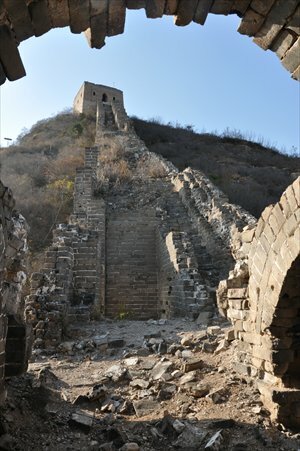 "The damage to the Great Wall comes not only from nature, but also from people," as Duan Qingbo, vice president of the School of Cultural Heritage at Northwest University in Xian (a starting city for Silk Road travel), told the Global Times, adding that even some local governments have brought damage to the Great Wall while constructing railroads or highways. "They think this part of the Great Wall has already collapsed and hardly resembles its earlier self." Duan said that in 2006, the State Council announced a regulation to protect the Great Wall, and there are similar written articles in the Cultural Relics Protection Law, but the enforcement of these regulations and rules has been weak. "[Awareness] not only among citizens but also among management authorities is needed," Duan added. 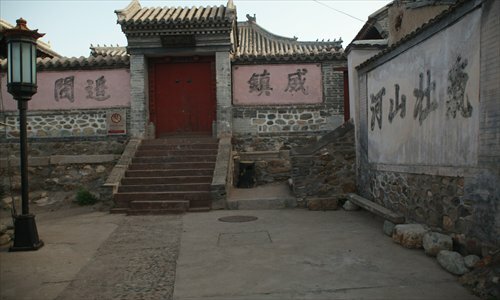 Gubeikou's attractions include more than its sections of the Great Wall, such as the three-bore well, the ancient royal road, the Yang Linggong memorial temple, and Yaowang (a medicinal king and bodhisattva) temple. Though much less grand than the historical sites in Beijing, each is linked to old folk legends, which add an element of mystery. The three-bore well, for example, is said to provide three different flavors of water, each bore offering a distinct taste. It is said that He Sheng, a corrupt Qing Dynasty official, wanted to fawn on Emperor Qianlong (1711-99) and said he could taste three different flavors from the well. But his petty trick was sidelined by two other loyal officials, who suggested that the emperor give He the honor of representing him and distributing the tri-flavored well water to all members of the entourage. As a result, He had to stay up all night distributing water. Yang Linggong temple was built in honor of a Song Dynasty general named Yang Linggong and his family. Yang and his family are famous for their bravery in fighting against the invasion of Liao, an ancient northern tribe. Legend has it that the temple was built by his enemies, for even they admired his bravery. The temple has two halls, each of which has a series of outer rooms, together totaling over 20 rooms. Most of the buildings of the temple were built with earth and wood, and the complex occupies about 1,200 square meters. Finally, there is an unassuming road east of the temple. Small as it is, it used to be a road for the royal family. This road was built during the Emperor Kangxi period, and was one of most used roads of the era. Whether the emperor wanted to go hunting in the forest, patrol the borders, or go to his summer dwelling palace when it grew too hot, this is the way they had to pass. With the vistas up high and the sites down on the ground, Gubeikou has something for everyone. There are many ways tourists can get to Gubeikou from downtown Beijing for popular China tours, either by car, bus or train. Trains are recommended as the bus can take up to six hours. You can take train No.4471, which leaves from Beijing North Railway Station. Though there is no ticket available for Gubeikou, you can buy one to Huairou North and then get off at the Gubeikou stop. Another option is the No.980 bus from Dongzhimen long-distance bus station, which will take you to Miyun county. Get off at Miyun Station, and then transfer to the No.25 bus to Gubeikou Station. From there, you will have a kilometer walk to the foot of the hill that the Great Wall was built on. For those who prefer to drive, just follow the G110 road to its end. It takes about two hours. Accommodations can be found very close to the wall, if you want to stay in local people's houses. It's about 40 yuan($6.41)/person/night in folk houses, and about 80 yuan for three meals each day. The high mountain lake is about 4.8 square kilometers in area. The lake is a travel destination included in packages of Silk Road travel since the surrounding mountains are so high -- approaching the height of Mount Everest, the scenery is rugged and beautiful, and the lake is next to the Karakoram Highway that links Kashgar and Pakistan. There are accommodations along the lake in Kyrgyz settlements. The ride on the Karakoram Highway is interesting. The highway passes by high valleys where people herd various kinds of animals, and it goes down to the cultivated Uighur tree-lined farms around Kashgar. Accommodations may be had at the lake in a Chinese hotel, in huts or in Kyrgyz yurts. The best accomations will probably be in Kyrgyz-owned yurts next to the Kyrgyz people. People may also bring their own tents. People can hike around in the area, but a lot of people will probably get altitude sickness since the lake is at a high altitude of 3,600 meters or 12,000 feet. It hasn’t yet been turned into a big tourist resort destination, so people can find some solitude though the nearby highway means that people will also hear traffic noises. The lake has a maximum depth of 242 meters. This makes it reflect the surrounding mountains and gives it a variety of hues depending on the weather. There are three peaks near it that are over 7,500 meters or 24,600 feet. Muztagh Ata is 7,548 meters tall, Kongur Tagh is 7,646 meters tall, and Kongur Tiube is 7,530 meters tall. For comparison, this is higher than any mountain in North America. The two Kyrgyz villages and Kyrgyz herding their animals gives the place an exotic feel, and people can go for rides on the camels or horses. Though the Kyrgyz might try to gauge people on prices, economical meals and places to stay can be found by checking around for what is available. Yurt prices per night start about 35 RMB or about 5 USD. The Chinese hotel and non-native accommodations cost more, and it is said that they try to rip people off. It is probably best to bring your own clothes, food that you like, toilet paper and water. A very warm sleeping bag is useful because even during the summer the place is very cold at night. Since the lake is on the Karakoram Highway, the beautiful and exotic scenery during a ride from Pakistan or Kashgar is interesting in itself. People can see various ethnic groups such as Tajiks, Kyrgyz, Uighurs and others during a journey between Kashgar and Pakistan. Unlike what people say, hiring a China travel guide, a permit or an entry fee to the lake area are not mandated. To avoid a lot of hassle, it is probably best to plan a trip by yourself by using taxis, buses or local transportation and by finding accomodations with the Kyrgyz people once you get there. During the summers, there is short green grass with grazing animals near the lake, but in the fall the land around the lake turns brown like the color of camels. If the sky is clear, the blue sky and snow-capped mountains reflecting in the lake is something to remember and makes for beautiful photos. 1. Small lake at an elevation of 3,600 meters (about 12,000 feet). Rugged scenery in a high remote plateau. Measures 4.8 square kilometers. 2. About five or six hours by regular bus from Kashgar near the Pakistani border. About four hours by rented vehicle or taxi. 3. Excellent scenery. Next to three peaks that are over 7,500 meters or about 25,000 feet tall. 4. The scenery along the Karakoram Highway that links Kashgar with the lake and Pakistan is as good as that at the lake site. Enjoy the drive on the highest paved international highway in the world. 5. Kygyrz people live there. For some checking around, economical but not generally comfortable accommodations may be had in Kyrgyz yurts. 6. Transportation during the travel season is easy since Lake Karakul is besides the Karakoram Highway that goes to Pakistan. 7. Enjoy hiking, camel or horseback riding. A hike around the lake may take about three hours. There are little streams to jump over. 8. The whole region is remote, exotic and rugged. 1. Location: The far western tip of China. It almost the farthest west one can go in Xinjiang (an optional destination included in affordable China travel packages). It is on the Karakoram Highway (G314) about half the way between Kashgar and the Pakistani border. It is about 4 hours by car from Kashgar. 2. How to go there: There is a daily bus that costs about 45 RMB or about 7.50 USD that goes to Lake Karakul and then on to Tashkurgan on the Karakoram Highway G314. It leaves at about 9:30 am Beijing Time or 7:30 am Xinjiang Time. The trip takes 5 or 6 hours. It might be possible to hire a taxi for about 400 RMB or about 60 USD round trip. The taxi trip takes more than 4 hours one way. From the lake area, it might be possible to find taxi rides back to Kashgar for about 150 RMB. 3. Season: It is best time to go is in the summer. From about November until about April, the place is too snowy and freezes. 4. Accommodations and Meals: The Kyrgyz yurts are the best bet for low prices and less hassle. Prices start at about 35 RMB per person. The place isn’t really government regulated, so it is kind of wild with people making up fees and trying to trick people. So ask around for good accommodations and meals. 5. Gear: A number of stores sell outdoor gear, camping supplies, and hiking supplies on Renmin Lu, east of Nanmen in Xinjiang. 6. What to bring: Bring a heavy coat for cold nights, extra clothes, food, sleeping bag, toilet paper, water and food you like. The food provided is kind of iffy, and bringing the additional things is a safeguard from being money gauged. 7. Fees: There is no entrance fee since this isn’t a government regulated site. People may try to charge you one at the main entrance, but don’t pay it. There is also apparently no travel permit required, though one can be got for 50 RMB from the police station in Kashgar. 8. Local Transportation: People can walk around or hire animals to ride. 9. Tours: Tours arranged from Kashgar seem to be iffy. It seems that often once tourists are taken out of the city, people raise prices and take people to places they don’t want to go. It seems best to go it alone with friends or to try to arrange for a reputable tour company to arrange a trip included in your popular China travel packagefor you before you arrive in the area. Kyrgyz people are a Turkic people who speak a language related to Turkish. About 150,000 Kyrgyz live in China. They were mainly ranchers of cattle, sheep, goats, camels and horses. Those who live around the lake during the summer work the tourist trade. They vacate the area in the winter. It is expected that travelers along this highway will increase, but a Chinese resort hasn’t been built yet. The Kyrgyz people and the other people at the lake have a reputation for trying to sell too much to tourists. Kyrgyz graze their animals by the lake when there is grass. Kashgar that is about 4 or 6 hours away is famous for its “Sunday Market.” It is a place to find tourist goods at about the cheapest prices available. There is a market for animals and a market for manufactured products and crafts goods. 1. Hiking, riding horses and staying in yurts. 3. Hike around the lake. 4. Save China moneycompared to staying in Kashgar. 5. Learn about Kyrgyz people. 6. Admire the scenery along the Karakoram Highway.